Home > Articles >What Do Rising Interest Rates Mean for the Stock Market? What Do Rising Interest Rates Mean for the Stock Market? 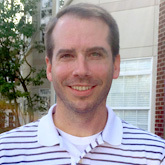 Our article, 2nd Quarter Review: Bonds Dominate the Story, discusses the significant rise in interest rates that has occurred since the beginning of May. That has been the dominant financial news story and has had far-reaching implications on a number of asset classes, including bonds, real estate, and gold. While U.S. stocks wobbled a bit initially as rates started to rise, the stock market has turned higher again in recent weeks with the S&P 500 recently hitting a new all-time high. Are stocks immune to changes in interest rates? If not, why have U.S. stocks been relatively unscathed so far? You may have heard the old stock market adage, "three steps and stumble" referring to the tendency for the stock market to fall after the Federal Reserve has raised interest rates three times. The reason stock investors normally fear rising interest rates is because they typically occur when the economy is going strong and the Fed is hitting the brakes in an effort to keep conditions from overheating and triggering inflation. Stock-market investors know from experience that when the Fed tries to slow down the economy by boosting short-term interest rates, they usually fail to pull off the desired "soft landing." Instead, the economy often winds up in a recession, which is obviously bad for company profits and stock valuations. In addition, rising bond yields increasingly compete with stocks for investor affections. That's the script under normal conditions. But as you likely realize, interest rates aren't starting out in the 5%-7% range this time. Instead, the 10-year Treasury bond was yielding only 1.6% at the beginning of May, and has risen to the 2.6% range since. That's still an extremely low rate by historical standards. So you can look at the current situation this way: the Fed isn't trying to slow down the economy by tapping the monetary brakes, as it usually is when it starts raising rates. Rather, the recent talk of tapering their "Quantitative Easing" purchases is merely a first step toward easing up on the gas pedal. In other words, the Fed has been taking extraordinary measures to stimulate the economy, and they're beginning to believe they can pull back from that extraordinary level of support. People's eyes often start glazing over at the term "yield curve," but hang in here with us a bit longer and you'll understand the clues picked up by yield-curve watchers. Normally, when the Fed starts raising short-term rates, the short-end (or the left-side of the curve in the nearby chart) starts to move up faster than the long-end (or right-side). That's because short-term rates are largely dictated by the Fed, while longer-term interest rates are set by the market based primarily on inflation expectations. 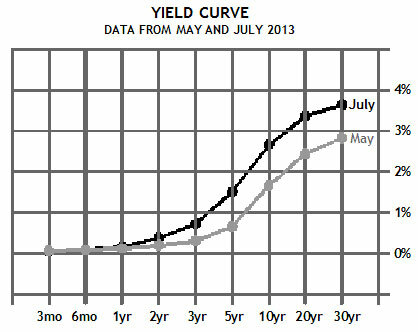 Normally, the Fed raising short-term rates causes the "curve" to flatten as the short-end catches up to the long-end. As the chart shows, however, that isn't what has happened this summer, which makes sense because the recent changes in interest rates haven't been caused by the Fed raising short-term rates. The chart clearly shows that short-term rates have stayed the same. In this case, it's been the long-term rates that have been going higher. This also makes sense, as this long-term debt is what the Fed has been buying through its QE program. A change to that policy means lower demand for bonds, and that is primarily going to impact long-term rates — exactly where we see the change in the current yield curve. To understand what this means for the stock market, we need to know how the yield curve and stock market typically interact. Generally speaking, when short-term interest rates are significantly lower than long-term rates, the yield curve is said to be "steep" and it's considered to be a good sign for the economy in the future. A steep yield curve is the result of the Fed's efforts to keep short-term rates low in order to boost economic growth in the future. We've had a steep yield curve since 2008 in an effort to support a weak economy. 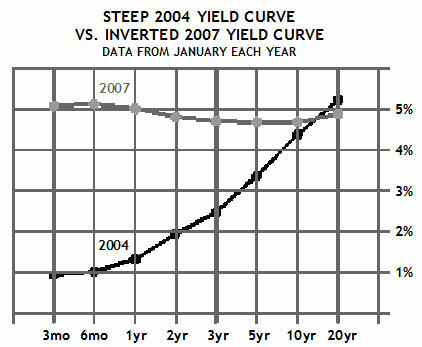 The 2004 line of the chart below is a good example of a steep yield curve, with short-term rates more than 1%-2% lower that long-term rates. And as you might recall, the economy and stock market did quite well over the next few years after that January 2004 condition. A flattening yield curve is a warning sign for both the economy and the stock market. Again, this usually happens when the Fed is intentionally trying to slow the economy down. Guess what — it works! Sometimes the yield curve will actually "invert," and short-term rates become higher than long-term rates. An inverted yield curve almost always spells trouble ahead. This was the case in January of 2007, as shown above. Notice how long-term rates had barely changed since 2004, but the short-end of the curve had risen substantially as the Fed repeatedly raised rates. Sure enough, just nine months later the forward-looking stock market peaked, and we all remember what happened to the economy as 2008 rolled around. We've discussed how the yield curve normally tends to flatten when interest rates begin rising, and how this is usually a bad thing for the future of the economy and stock market. But the yield curve hasn't been flattening in this case — the first chart clearly shows that the yield curve is actually steeper now than it was at the beginning of May when interest rates started rising. This would normally be interpreted as a positive sign for both the economy and stock market over the next year or two. Perhaps not surprisingly, then, most of the recent economic news has continued to be positive, and the stock market has rebounded strongly from its initial panic attack in late May-early June. However, it would be unwise to simply conclude the stock market will necessarily see smooth sailing ahead. Precisely because the current situation is so different from anything that's happened before, we can't be overly confident that the rules and relationships that have governed market events in the past will hold true this time around. The Fed's QE program was unprecedented and nobody truly knows what is going to happen as it is unwound. The biggest threat may be that the economy isn't actually strong enough to walk on its own without QE support. If that's true, the planned tapering of those QE purchases, combined with higher interest rates, could tip a weak economy back into recession. While there are still significant risks and pitfalls that could trip up the stock market in the months to come, it's comforting to know that, at least to this point, the drama in the bond market hasn't impacted conditions in a way that is obviously harmful to the stock market. Many observers have long expected a "great rotation" of assets out of bonds and back into stocks — the opposite of what happened from 2008-2012 — once interest rates began to rise. It's premature to say that move is underway. But if such a move does become reality, it would only further the stock market's advance.